We’ve selected five candidates for “Best Mobile Application” award of 2009. The candidate with the most number of votes by January 31 wins the 2009 Readers’ Choice award. An Editors’ Choice award will also be awarded at the same time. 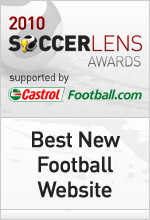 Also See: Soccerlens Games – for the latest tips and reviews on football games online and on your mobile.